PERC, Chennai has recently identified a species of algae which can effectively treat textile effluent. After successful trials at the laboratory, field level trials were conducted at SUNTEX PROCESSING MILLS, a textile dyeing industry situated in Gummudippoondy near Chennai. 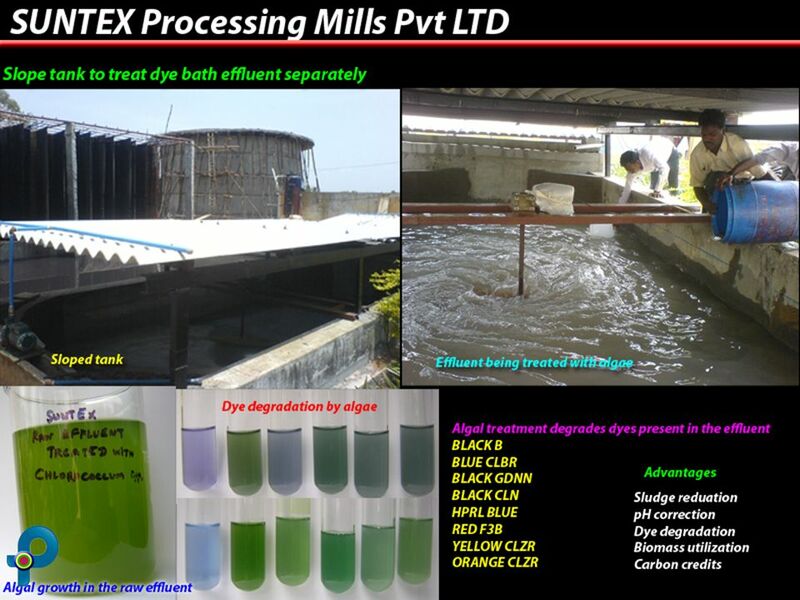 Dyeing industries conventionally treat their effluent by using lot of chemicals. Highly alkaline effluent is neutralized using acid and the residual dyes are bleached using bleaching chemicals. The sludge is precipitated using a number of chemicals and the resultant sludge is dried and stored as hazardous solid waste waiting for land fill to dispose them. The liquid effluent is either discharged or sent to R/O plant for recycling. The R/O reject is again evaporated using SEPs (solar evaporation ponds). The resultant sludge is again stored as hazardous solid waste. The problems caused by effluent disposal in and around Tiruppur area are well known. Algal Biotechnology Unit of RKM Vivekananda College, Chennai headed by Dr V Sivasubramanian, started working on textile effluents after their successful project with SNAP ALGINATES & NATURAL PRODUCTS, Ranipet, Tamil Nadu. The first ever pycoremediation plant in the world was set up during September 2006 and has been working for the last 2 years successfully. This plant has been visited by scientists from India and abroad. The main achievements of the plant at SNAP are pH correction and sludge reduction. Following this successful demonstration of algal technology, the research scholars of algal biotechnology unit worked on effluents from STAHL India (Chemical industry producing leather processing chemicals), Ultramarine Pigments (detergent manufacturing industry) both at Ranipet, Tamilnadu and Perfetti van melle a confectionary industry near Guduvanchery, Chennai and submitted M Phil and PhD dissertations and presented research articles in conferences and published them in scientific journals. The micro alga selected could tolerate and grow very well in the raw effluent. Algal growth corrected the pH and removed colour, odour and sludge. Conventional treatment process employs chemicals to achieve this. Algal technology has achieved this without using any expensive and toxic chemicals. The industry saves lot of money on chemicals. Since there is significant reduction in sludge (80%, which can be improved during scaling up) the pollution problem caused is prevented. The remaining water can either be evaporated using SEPs or send to R/O plant for recycling. R/O reject can also be recycled to algal treatment plant and treated to prevent sludge formation. Tube No. 2 shows effluent treated with conventional chemical treatment. The pH is around 9.6 and a TDS of 10,280 mg/L, which much higher than the raw effluent due to usage of chemicals for treatment, and sludge formation is 100%. The scaling up process is on now. There is also an attempt to treat the dye bath effluent separately using the algal technology. The excess algal biomass settling in the treatment tank is being dried for possible use as fuel for the boilers at SUNTEX.